The Rancher takes no prisoners, but is it all style and no substance? A lot of guitar for not a lot of cash; worth plenty of your attention. Not everyone wants to grab this much attention. Recently we reviewed another Rancher, the Penguin Parlour, and compared its aesthetic to Vegas Elvis. The Jumbo in black as seen here would therefore be Johnny Cash, but the Cash of the 80s, before Rick Rubin picked him up, when he was the faded rhinestone cowboy in black. The Falcon Jumbo’s vast soundboard is solid spruce; the quality cannot be determined due to the black polyester finish, so the tone, which is always the primary gauge anyway, will have to tell the story. That top, which is a huge 17” across the lower bout, is bound with gold glitter that makes no attempt at subtle, understated, or classy - but goes straight for Vegas Showgirl. There’s a Rancher standard triangular soundhole, no rosette, but the triangle is bound in more gold glitter and a large gold pickguard with a Gretsch logo and a falcon. The back and sides, which are laminate (the spec says laminate maple, but honestly, you can’t see any veneer because of the paint, so let’s not gild the issue too much) are also bound in gold sparkle, with a gold sparkle heel cap. The rosewood bridge is elegantly curved, with a notch which is aesthetic only, a synthetic bone compensated saddle, and white plastic pins. The 21-fret neck has a rosewood board with unusual appointments. There’s the by-now-familiar gold sparkle binding, which really jumps out at the player here, but within that are two more plies of black and white binding, which is luxurious against the undeniably trashy appeal of the gold. The fret markers are semi circles, or rather, in most cases, semi ellipses (the diameter gets bigger as you go down the board, but the shapes don’t intrude any further onto the board), which Gretsch describes as ‘neo-classical thumbnails’. These are quite attractive and certainly lend a unique appearance to the guitar. There’s a synthetic bone nut and the large trademark Gretsch headstock has a vast, glittering logo, a sparkle trussrod cover, and gold sealed back tuners. Hardware wise, there are knurled gold strap buttons which have a very industrial feel to them and a Fishman Isys pickup system. This has an undersaddle piezo pickup, and a head unit with a tuner, volume, and three band EQ, so it’s well equipped for the stage. The whole guitar is well executed, not fancy in a complex, luxurious way (apart from the neck binding), but the work is done right and there’s no sloppiness to point at. The looks will not work for everyone, but here, we love them; the black and the glitter together have almost a John Travolta in Grease feel; there’s a leather jacket edge to it, but not with real menace - more in a Broadway musical way. Make no bones about it; this is a really big guitar. Playing it on your lap, it could be too imposing, especially for a smaller player: the huge lower bout and the towering 4.3” depth mean that you really know you’re holding something; it doesn’t vanish into your arms. Standing with the guitar on a strap is easier, but the depth is still there. That’s no bad thing; players of large guitars usually want to feel the beast tangibly, but it won’t be the ideal big guitar for someone who wants the tone without the physical imposition. The neck is fairly slim; not like a shredder guitar, but certainly there’s no vintage heft that would make it a D or U shape rather than a C.
Not only is the guitar big, but it sounds big. A spruce top and laminate back and sides only takes you one place; bright and direct, but Gretsch does it well; this is the third using that recipe we’ve had in a short period and they are all really good. The treble end is bright, but not thin or biting; there’s enough body that if you play it gently, it’s delicate and ringing. If you hit it hard, it’s punchy and cuts through. This continues as you hit the midrange; there’s a pleasing fatness to the tone, but not a ton of harmonic complexity. The key things you get are volume, sustain and projection, which is exactly what you’re looking for in a jumbo - it’s not supposed to be a delicate instrument, it was designed to be louder and forceful. The bass is really powerful, though, demanding attention and with the potential to be overwhelming if you push it too hard. Played fingerstyle, it’s a rewarding guitar, but you’ll have to regulate your right thumb if you’re used to a smaller body, because there will be far more bass than you are used to. Play with delicacy and restraint, and the top end and mid range dance and sparkle for you. Strumming fairly gently produces a strong, bright tone. Push hard, and things get really loud, but try as we might with a heavy gauge pick, we couldn’t get the tone to break up - you can really drive it hard. Interestingly, when played this way, the bass doesn’t get out of hand the way it sometimes can playing fingerstyle. We dropped it first to drop D, which it handled with ease, and then even to drop C (only tuning the lowest string down, not the whole guitar). Even that Low C rang out true and strong, which is testament to the construction of this big box. 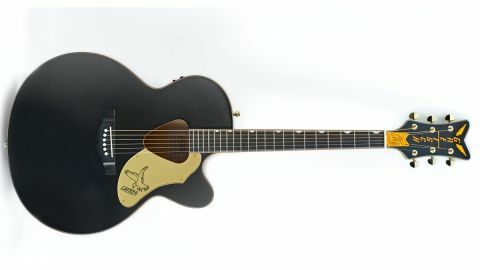 This is a nice sounding guitar, with a huge strong suit as a big strummer, but plenty of flexibility. Of course, it plugs in as well and the Fishman Isys, while not an absolutely top end system, is more than adequate. You have to be a little careful since punch is already abundant in this guitar, with the piezo adding a little more - and a little quack. Judicious taming is required to make such a big beast and big tone manageable through an amp, but the EQ is more than capable and we wouldn’t hesitate to take it on stage (indeed, it might be considered ostentatious when sitting in a circle at a folk club). This guitar is not for the shrinking violet. You can have it in black, or white, or for a little less money, in a sunset red without the glitter and the V shaped headstock. But no matter which you choose, it’s an attention grabber. That goes for the looks and the tone; you’re betting big, brash, loud and attention seeking. If that doesn’t appeal, look elsewhere. If it does, though, this isn’t far off as good as the Boulder Creek jumbo we looked at last year - and half the price. It’s not a J 200, but it’s not ridiculous to talk about them in the same breath. It’s a lot of guitar for the money, is what we’re saying, and if the Marmite styling appeals, you really must play it before buying something else. It looks like a novelty, but it’s not. It’s a serious guitar, wearing a leather jacket, with a sequinned gold belt - we love it.